Location: Hangzhou Xiaoshan International Airport is about 17 miles (27 kilometers) away from Wulin Square, the center of the downtown. This airport is about 1.5 hours' driving distance to Suzhou and 2.5 hours' driving distance to Shanghai. Brief Intro: Hangzhou Airport is considered a Garden Airport due to its verdant setting and floral gardens and is one of the most important territorial airports in China. Currently, this airport is home to 55 airlines. It operates flights to 86 domestic cities, such as Beijing, Shanghai, Chengdu, Xi'an and Guangzhou. In addition, it offers flights to 35 international cities/areas like Kuala Lumpur, Amsterdam, Bangkok and Singapore. From Jan. 30, 2016, 144-Hour Visa-Free Policy is available to facilitate passport holders of 53 countries and regions when making an international transfer via Xiaoshan Airport. Passengers can enter and exit from this airport, Nanjing Lukou Aiport or any port in Shanghai. Nowadays, there are three terminals in this airport: T1, T2 and T3. T3 was newly-built and was put into service on 30th, Dec., 2012. With an area of 203,300 square yards (170,000 square meters), it greatly reduces the pressure of the other two terminal buildings. Besides, all international flights depart from T2 (Terminal A) and domestic flights depart from T1 & T3 (Terminal B). 1. In order to complete the boarding procedures in time, passengers should arrive at the airport 2 hours before the departure time. All the check-in counters will be closed 40 minutes before the departure time, except that to catch the flight to Amsterdam because its check-in counters are closed 60 minutes before departure. 2. If passengers do not have luggage, please check in through no-luggage counters. If one gets an e-ticket, it is ok to check in via the automatic check-in machine. For passengers to and from this airport, both shuttle buses and taxis are available. At present, there are shuttle buses to over 20 directions, including downtown Hangzhou, Xiaoshan District, Shaoxing (Keqiao), Yiwu, Jinhua, Suzhou, Qingtian, Zhuji, Hengdian, Huzhou, Xinchang, Shengzhou, Jiaxing, Haining, Yongkang, Jiaojiang, Luqiao, Wuzhen, Anji, Shangyu, Linping, Quzhou and Linhai. Baggage Claim, Baggage Carts, Baggage Packing, Storage and Lost & Found, Currency Exchange, etc. As international flights are all operated out of the Terminal A now, passengers with on-going boarding passes just need to affirm their boarding gate information on the display screen or by asking the staff, and then walk to the Departure Level and wait for your flight at the correspondent waiting area. If you don't have your next boarding pass, you need to claim your luggage and go to International Departure Level to finish the boarding procedure. All international flights are in Terminal A. Passengers with on-going boarding passes need to pass Quarantine, Customs and Security Screening before going to Terminal B Domestic Waiting Level for your next flight. If you don't have your next boarding pass, you need to do the International Arrival procedure and claim your luggage, and then go to Terminal B and finish the Domestic Departure procedure. Passengers who transfer from a domestic flight to an international one need more than 1.5 hours for transit. If you have your next flight's boarding pass, you just need to affirm your boarding gate information and then walk to the International Waiting Hall in Terminal A and wait for your flight. If you don't have a boarding pass, you need to claim your luggage and finish the International Departure procedure and wait for your flight at the correspondent waiting area in Terminal A. When transferring from one domestic flight to another, passengers with on-going boarding passes just need to disembark and walk to the corresponding waiting hall to wait for your next flight. Passengers without boarding passes need to claim their luggage and find the check-in counter and finish the procedure for Domestic Departures. 1. Passengers can ask the ground service staff for help when need to transit flights. 2. For passengers that need to wait overnight for a transit, you can wait in the hotels around the airport. Most of the hotels have free shuttle service to and from the airport. Hello, my flight got rescheduled and is going to arrive shortly before midnight at Xiaoshan Airport. My destination in the city is in the Wuchang District. From what I read so far the shuttle buses won't operate between midnight and 5am. Can you recommend how to get to my destination (e.g. take a cab? How much would it cost roughly from the airport and how much would it cost from e.g. the Wulinmen CAAC Ticket Office?). Do cabs provide service during the night in front of the airport or do I need an app to call someone? The Shuttle Bus Wulinmen Line doesn't stop until 2:00. If you arrive after 2:00, you can only take a cab, the fare is CNY110 to 130. Thanks for your answer Julia. Do you know if it's easy to take a taxi from Wulinmen Station to Wuchang District? Yes, it will be easy for you to take a taxi from Wulinmen to Wuchang District. Don't worry. I want to go yangzhou from hangzhou xiaoshan Airport. How can i go ? Take shuttle bus Wulinmen Line and get to Wulinmen CAAC Ticket Office Bus Stop. Then take bus no.153 to North Coach Station. After arriving, there are several coaches that can take you to Yangzhou directly. 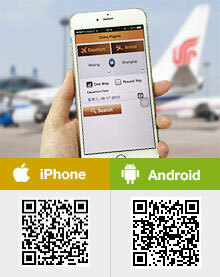 Hello, could you advise how to reach Ho Fang International youth hostel (in Qing Hefang street) from Xiaoshan airport? Thank you! You can take airport shuttle bus Binjiang Line and get off at Jiangling Road Station first. Then transfer to metro line 1 to Ding'an Road Station, Exit D. Walk south around 1km to find the youth hostel. Upon landing, take airport shuttle bus Wulinmen Line and get off at Wulinmen CAAC Ticket Office. Then take bus no.153 to the North Bus Station. There are several coaches to Huai'an. After arriving, take a taxi to the destination. How to go from Hangzhou to Jiuwashan? Sorry, I didn't find Jiuwashan on the map. Do you have the exact address?